Let's face it. You need a Web site. But how do you know what you need on your Web site, or who to trust? We'll walk you through it with 15 things you need to know about your site. What good is a Website that isn't found? Marketing your site with SEO or Social Media connects you to your online audience, allowing you to reach the right people. You can spend hundreds of thousands on web management. But a campaign that works will be specific to your business. We will work with your budget. We can help you manage the cost. It's time to state something obvious. You need an awesome Website. You may already have a Web site. You may believe that you don't need a Web site. The truth is, that whether you have a multi-billion dollar business that is doing just fine without a Web site, or you have a snowcone truck that is only open June-August'you need to have a Web site. Why? You are missing business if you don't have a business. As people become more dependent upon the Web and less dependent upon other forms of advertising, having a Website is tantamount to having a yellow page listing 20 years ago. Without it, you don't exist. Having a poorly designed Web site can actually be harming your business. People go to a site, look up information about your business'and find an unprofessionally designed (or simply outdated) site. There is a good chance they don't care. But if they do, you could be losing customers. It makes more sense to have no site than a site that makes your company look bad. It's a second store front with no utilities to be paid and can take your copmany to a new level. What is stopping you? 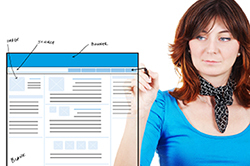 What are the Elements of a Good Web Site? A solid Web design. Let's revisit the idea that a bad site is hurting your business. Work with your designer so that your ideas are represented, and ask for guidance so that the design is relevant and user friendly. A marketing plan. A web site without a marketing plan to get it to your customers can leave you frustrated. Every day, Google processes millions of searches. Yet, 90% of the clicks from those searches are to pages that are listed on the first page of results. If you're not on the first page, 90% of the people searching for your term simply do not know you exist. Of course, SEO is not the only way to achieve effective marketing. Depending on your target audience demographic and the type of business you have, you may need to consider SEO, Social Media, or even E-mail marketing. Quality content. People aren't looking for a pretty site. They are looking for a quality site with the information they are looking for. Even if you have a Web 2.0 site with fantastic features and a tasteful design, if the information they were searching for isn't there, or if they don't interpret the information to be relevant to their needs, you won't have a client at the end of the day. Professional services for web design, such as content creation, web editing, and photoshop and photography make the space a useful one. To learn more about how our IT company can offer the support, maintenance, and consulting services that you need, contact our IT company today. You can also learn more about our services by browsing our company website.